“Northwesterners” seem to have sustainability in their DNA. 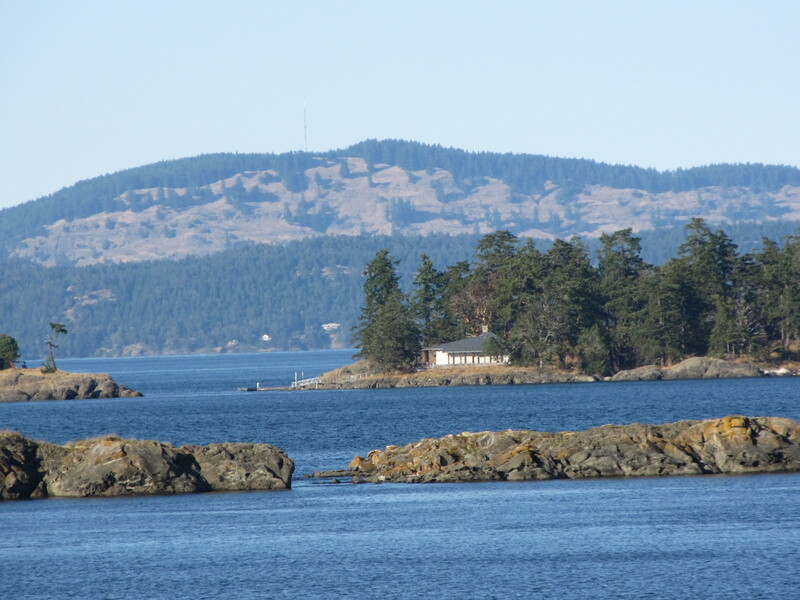 At least that was the impression formed during a recent trip to Vancouver, Victoria and Washington State’s San Juan Island. “Want to grow your own food?” asked a poster on the bulletin board of a vegan café in Victoria, British Columbia. “We can help,” it promised, the “we” in question being a local non-profit promoting food security by helping city dwellers plant edible urban gardens. By the time we entered the café that morning, such an announcement easily could have escaped our notice, signs of sustainable living were so commonplace. All the green and local stuff was starting to blend into the gorgeous scenery, fully integrated into day-to-day life. Is this what it would be like if everyone back East got it, we wondered? (What an inspiring thought.) Of course, in fairness, the Delaware River Valley already is full of folks who understand the importance of buying local food, supporting farmers, shopping locally and making eco-conscious choices. 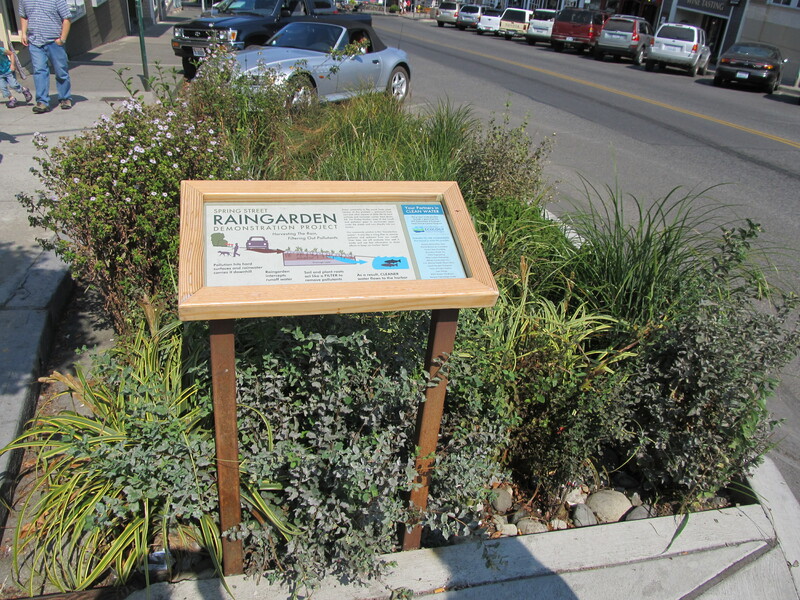 Yet, it ‘s probably not a stretch to say that many Northwesterners adopted the green-local-sustainable mission earlier and have taken it much more to heart. It’s also clear that in the Northwest, sustainability is not just a matter of personal choices. From government subsidies for mass transit to eco-conscious city planning to forward-thinking private enterprise, Northwestern sustainability would appear to be no longer the exception, but the rule. Maybe the Northwest’s contemporary greenness is the legacy of all the hippies who settled there in the late ’60s and early ’70s. Perhaps having year-round access to fresh local produce AND some of the world’s freshest, most delicious seafood makes eating local the obvious choice. Or maybe it’s no great leap to want to protect Mother Earth when you’re surrounded, 24/7, by the astounding natural beauty of the Puget Sound and the snow-capped Cascades. Whatever fuels the area’s green vibe, examples of sustainable living are in no short supply — on either side of the U.S.-Canadian border. Eco-cargo is all the rage on the streets of Vancouver, where bicycles equipped with small cargo containers are delivering office supplies and other goods. This is just one more great use of the city’s many bike lanes. Learn more at:. http://www.cbc.ca/news/canada/british-columbia/story/2011/03/22/bc-vancouver-bike-lane-cargo-trikes.html. At a large chain hotel, we could flip a master switch to turn off all the electricity when we left our room. A polite counter card suggested we forego bottled water for the hotel’s quality tap water. Windows could be opened, letting in the cool Vancouver breeze and reducing the need for AC. Organic and local food is everywhere, not just at food markets, but also in all types of restaurants. A popular seafood shack on Victoria’s wharf promotes its fresh catch of the day — but also it’s firm commitment to fishing sustainably and catching only what’s abundant and not endangered. 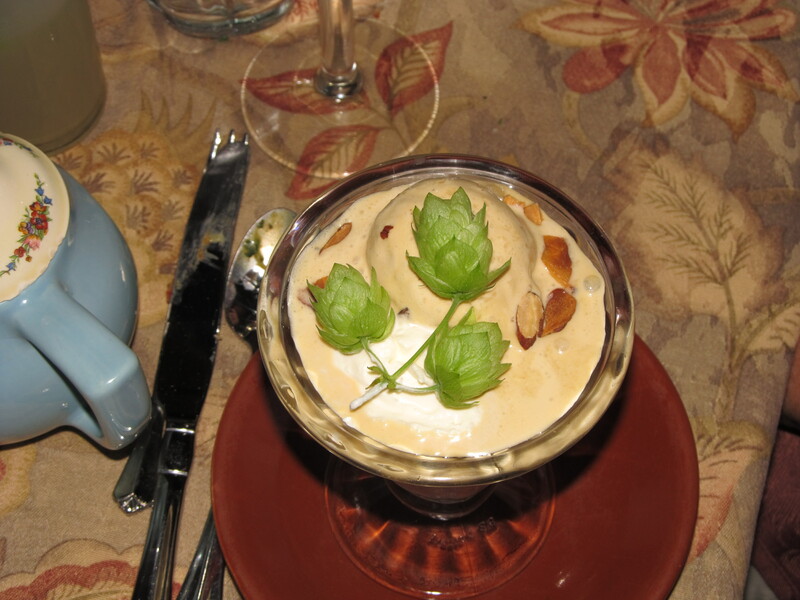 A terrific San Juan Island restaurant, Duck Soup, features delicious local, organic ingredients. Shoppers don’t need to look far to find goods of all types that are local, organic or fair trade. In fact, local, independently owned retailers and restaurants promote themselves collectively in a handy guidebook for Vancouver and Victoria. 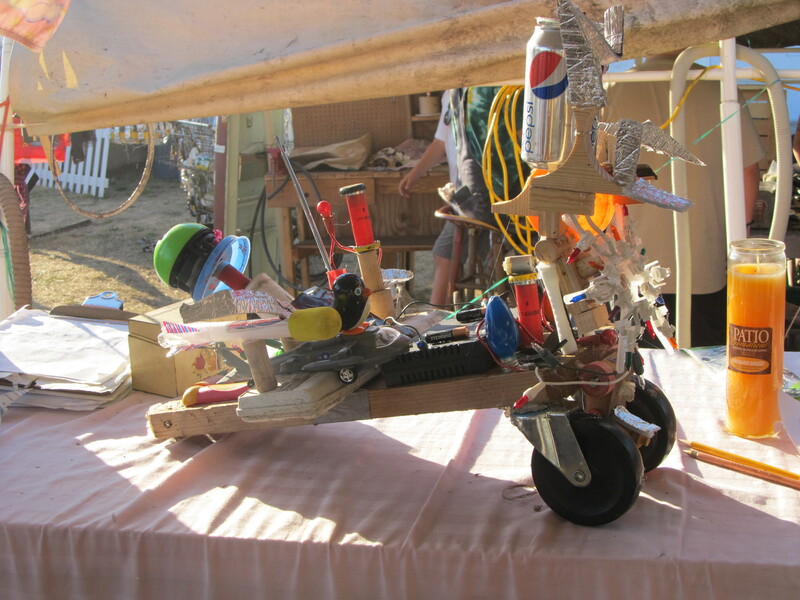 An upcycling sensibility was on display at San Juan Island’s annual 4-H Fair. We missed a trash fashion show, but caught a display of pieces like the one shown here. You can travel virtually anywhere in Vancouver and Victoria via public transportation that is inexpensive, easy to use and even, at times, entertaining . (Some bus drivers provide guided tours at no extra charge.) Even the Washington State ferries are a bargain and well-maintained. 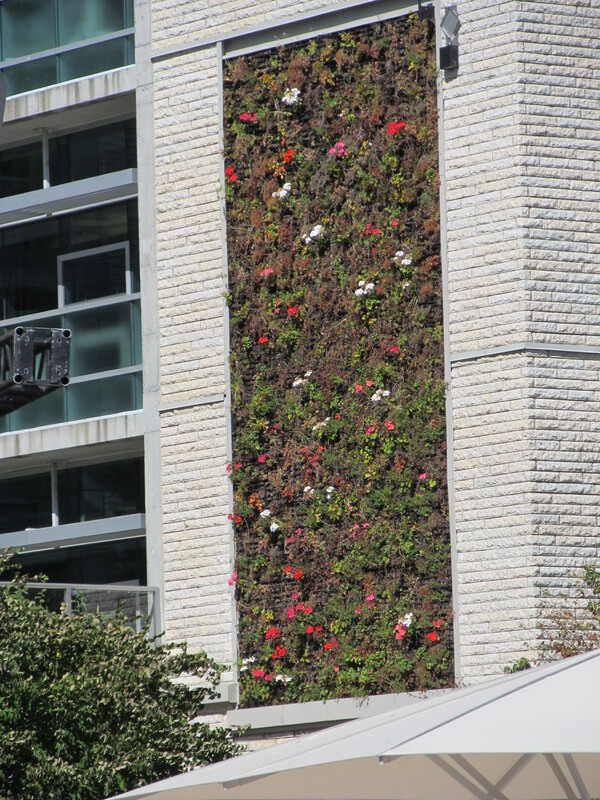 Green roofs are abundant…and so are green walls. 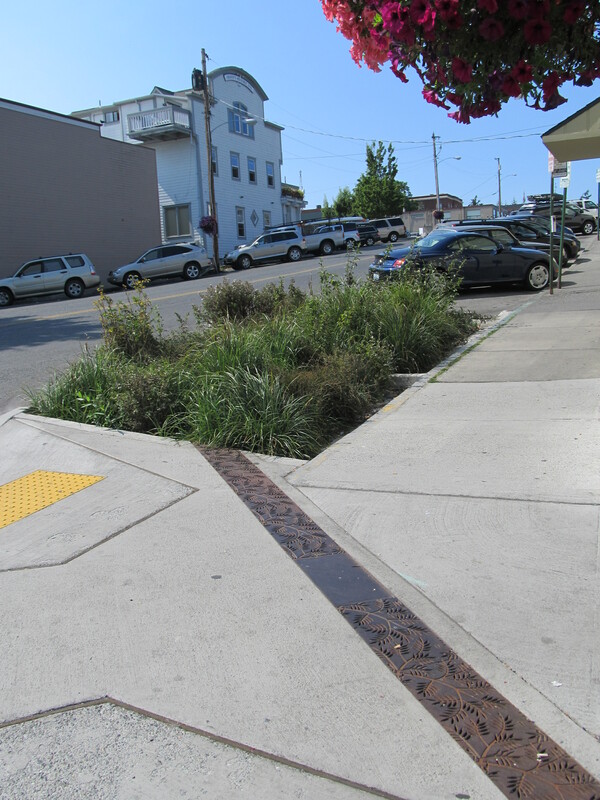 San Juan Island’s Friday Harbor is using a natural drainage system to reduce storm water runoff problems. Ok, you get the idea. And yes, some of this is taking place much closer to home…and it’s very likely that not everyone in the Northwest is on board the sustainability bus. But it was wonderful to get a glimpse of what it can mean on a grander scale. Food for thought for our own beautiful region.